Ronnie Dio (as he was known throughout his musical career) began his musical career whilst still a relatively young teenager in the late 1950s, initially playing trumpet, french horn and then bass guitar before eventually moving on to singing vocals. Without any formal vocal training, Dio always attributed his powerful voice and breaking technique to having learned to played the french horn. 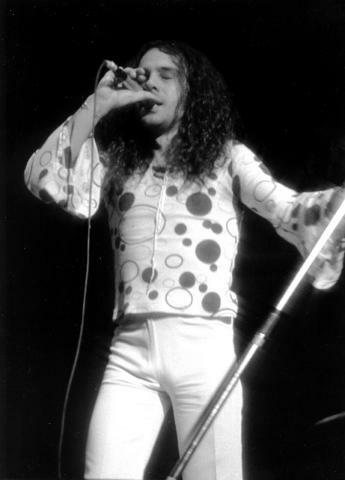 He recorded several singles throughout the 1960s under the name ‘Ronnie Dio & The Prophets’ until forming the Electric Elves in 1967, shortening the name to Elf in 1969. A few years later they supported Deep Purple on their 1974 ‘Burn’ promotional tour whereupon he was spotted by Blackmore. Initially persuaded by Blackmore to record a solo single that Deep Purple had refused to consider (‘Black Sheep Of The Family’ originally by Quatermass), the session went so well that they decided to record an album of material using the Elf musicians (with the exception of the guitarist, naturally!). Blackmore quit Deep Purple immediately after the conclusion of the 1975 European Tour and Ritchie Blackmore’s Rainbow was born. Dio contributed massively to the initial sound and success of Rainbow but did not share Blackmore’s later pursuit of a more ‘radio-friendly’ sound in order to gain commercial success. Dio believed they should have gone ‘harder and heavier’. They parted on reasonably amicable terms after the conclusion of the ‘Long Live Rock ‘n’ Roll’ tour dates in 1978. Dio next helped to resurrect Black Sabbath’s ailing fortunes with arguably one of their best albums, 1980’s ‘Heaven And Hell’. Tony Iommi and Geezer Butler accused Dio of interfering with the mix of their 1982 live album ‘Live Evil’ and the band split. Dio formed his own self-titled band in 1983 releasing 10 albums and touring extensively until 2006 when he announced his decision to reform a version of Black Sabbath with Iommi, Butler and Vinnie Appice under the moniker of ‘Heaven And Hell’. They released one album and toured in 2008 with plans to release a follow up in 2010. Sadly, Dio was diagnosed with stomach cancer in November 2009. Despite initial positive responses to treatment Dio died on 16th May 2010.